1. How to book a cruise? 2. What should I do first after boarding the Yangtze Cruise? 3. What does the Yangtze Cruise Ticket include? Druing your time on the Yangtze River, you may have chance to visit or excursion to the following places,but not all. The scenic spots are chosen by each ship. Fengdu is an ancient city with a long history. It is also known as the so-called "Abode of Ghosts." According to superstitious legend, "the dead come to Fengdu and the devils go to hell." 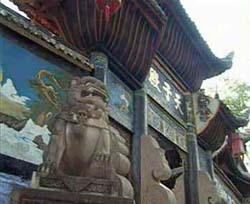 Since Tang Dynasty, forty-eight temples have been built in this place, such as the "Hall of the Jade Emperor," the "Palace of Hell, " "Boundary Between the Living and the Dead, " the "Ridge of Helplessness," and the "Balcony of Nostalgia." All of the temples there look quite magnificent while statues are extremely lifelike. 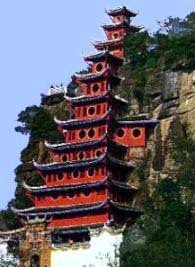 The whole building, composed of a gate, gate tower, and an ancient Buddhist temple on the top, guards the only path up the mountain. The cultural relics and calligraphy and paintings by famous persons were unearthed in Zhongxian County since the New Stone Age are displayed in the hall. It is called one of the "world$$s eight great majestic buildings." Baidi City or the City of White Emperor is not a real city, but a mini city with some temples and gates on top of Baidi Hill in Fengjie County, located at the entrance of Qutang Gorge and 8 km from Fengjie County seat. Climbing over 500 steps, you can reach the top. It is the starting point of the Three Gorges and is most famous for Li Bai$$s great poem about the city written in the Tang Dynasty. In China, you can rely on us.